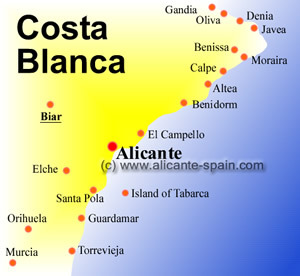 To get to Elda and the city of Petrer, we once again have Alicante as our meeting place at the Costa Blanca and from there we take the N-330 to arrive at one the most interesting combinations of neighboring towns in the province. 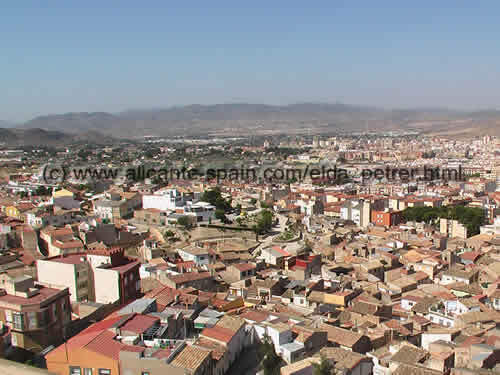 Between both cities Elda and Petrer there is only one street which separates them, which therefore gives them the right for each of them to have their own town hall. There used to be about 4 kilometers between them but as each of them grew in population, they also grew together. 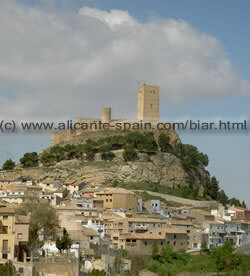 In Petrer to the west, there is a hill which nestles a typical Arab castle going back to the 12th century. It was later used as the home for noble families and is now open to the public. 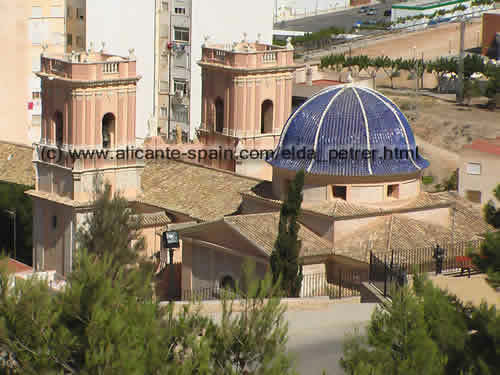 There is a lovely chapel where weddings can be celebrated or a type of museum with antique findings, especially pottery pieces from the X-XI c. It is decorated with shields showing that the Moorish and Christian domain were both present. Coming down through the slated winding streets you come to the Neo-classical Sant Bartomeu Church with old style stained glass windows from the 18th century. What most called my attention was the beautiful altar. And on the hill ‘ La Torreta’ is the Monastil which is an Iberian-Roman archaeological find and seems to come from the Bronze Age. Quite impressive! 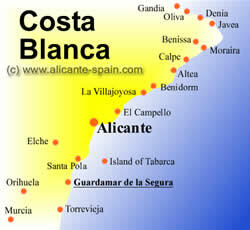 Let’s call it the heart of the Costa Blanca. 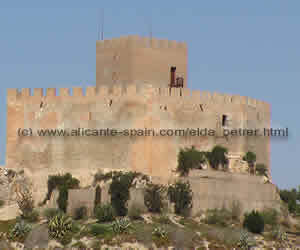 Elda Petrer are located about 30 km from the Costa Blanca coastline.. In Elda on Chapi Street, 32 is where you can feast your eyes on the history of shoes and how they came to be – thank goodness! It was back in the mid 18th century that this industry first came about in Elda and how prosperous it made this city thanks to it. There are all kinds of gadgets, some quite weird, which show us how the first shoes were modeled, shaped and made. Old sewing machines and any kind of tools that were used in this industry. The designs are quite extensive and some make you shutter at how uncomfortable they must have and what would be and will do just to be fashionable. There are bullfighters slippers, flamenco dancers tap shoes and even some of the shoes that King Juan Carlos and Queen Sophia have worn. At the Bus station you can find more detailed information about Elda and some of the surrounding towns and even get some ideas on some walking tours around the area. 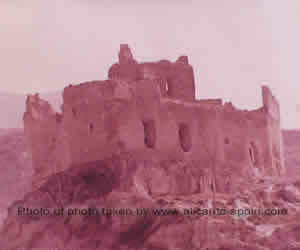 A photo taken at the museum inside the castle. It shows the large destruction the building has suffered from over the years. The Castle today – perfectly rebuilt, hosts a little museum offers a fascinating view over both cities. And as I also work up a good appetite and try all the local dishes I can so I delved into a portion of ‘fandango’ ( a stew of fresh codfish, potatoes, tomatoes and onions ) and another of rabbit and snail rice. Not to leave out the blood sausage and chick peas. I was not brought up on any of the delicacies but I am sure glad I found them – Or did they find me! If you are thinking about a day off the ordinary Costa Blanca beach life, then a visit to Elda and Petrer should be on your list.